LiFi is a Disruptive Innovation. There are countless use-cases for the technology in every aspect of our lives. 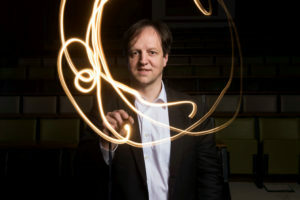 The team at the University of Edinburgh LiFi R&D Center, lead by Prof. Harald Haas, have been working very closely with pureLiFi to provide perpetual, free, last-mile wireless connectivity for the developing world. Imagine distributing the internet to every corner of the world at little more than the cost of a solar-panel and an LED light? Prof. Haas presented this idea on Monday at the 2015 TED Global Conference in London. Calling it “A massive extension of the Internet“, he discusses the enormous energy savings that can be made by offering solar power to deliver the energy for wireless communications as well as act as a LiFi receiver. During his talk, Prof. Haas focuses on the fact that more than 4 billion people worldwide don’t have access to the Internet, and with little energy infrastructure in developing countries to support traditional broadband and wifi, it will be a challenge to get it soon. This phenomenon, known as the digital divide, stands between people and information. For the first time in public, Haas demoed the extension to indoor LiFi technology, showing how light emitted by an LED could make a video play on a computer connected to a solar panel. Using this technology, any existing solar panel — on objects, houses and more — can be adapted to receive broadband signals using LiFi. “You can now stream video over lighbulbs“. The demo used a standard LED light to transmit video as fluctuating light signals, and a domestic solar cell connected to the Li-1st to receive the light signals. Haas told the audience at a TED Global. WIRED covered LiFi and Haas’s work in a long feature in the February 2012 edition. pureLiFi, where Haas is the chief scientific officer, will be leading the commercialization of the technology and not just disrupt the indoor wireless communications market with our Li-Flame and subsequent product ranges, but also the out-door last-mile connectivity industry.